6 Agosto 2018 – W.A.P. Geoffrey Basil Reeve, was the first Casey expeditioner to die while serving in Antarctica; he died of exposure and hypothermia in 1979 during a blizzard. 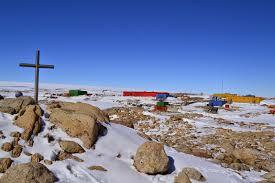 August 1979 at Casey Base, Antarctica: Geoffrey Reeve died of exposure after he became lost in a blizzard 10km from Casey. He was the senior electrical fitter-mechanic at the station, and deputy officer-in-charge. Early in August Mr Reeve was one of six members of the winter party who camped at Robinson Ridge, a rock out-crop about 10km from Casey, to undertake maintenance and biological observations. On August 5 he was moving in the camp precincts when he was caught in a sudden blizzard which reached a speed of 96 knots. Other members of the party found Geoffrey Reeve unconscious less than a kilometre from the camp. A search and rescue team, including the medical officer, Dr K. de Jonge, was sent from Casey by tractor, and brought Mr Reeve back to the station. Further resuscitation attempts were unsuccessful. Mr Reeve’s family asked that his body be returned to Australia for burial. It will be flown out from Casey on one of the two flights which a United States Navy Hercules will make from McMurdo Station in the first week of November.